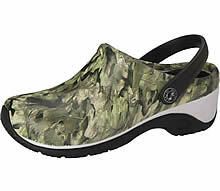 "WOW" Komfort construction features an anatomically contoured sole and footbed that cradles your foot with each step. Molded wood-grain styling. Flexible, light-weight, shock absorbing, and built to last. 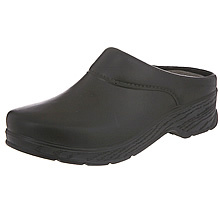 Slip resistant and oil resistant. Smooth polyurethane upper wipes clean with soap and water. Durable, easy to care for and washable. Has non-marking sole and a 2" heel.